The ‘Talking Head’ is one of our most requested types of video. You know the type; a representative of a business (their head) literally talking on camera. This approach is an effective communication tool, relying on the authenticity of a real person(s) to convey a message, that can then be overlaid with supporting illustrative imagery reinforcing the spoken word narrative. Given that video is an ‘always on’ communication channel, Talking Heads can be great at introducing viewers and potential customers to the people that represent an organisation, 24-7-365! Watch them in action for yourself. As with all sub-genres of content, there are subtle nuances in craft, camera work, editing, delivery, etc. that can make all the difference to the outcome. The following is intended to assist in understanding the variations to look for, when briefing your own Talking Head content. The best known version of this sub-genre, commonly utilised in news interviews and many documentaries. In this structure the interviewee literally looks off-camera to the interviewer, meaning the audience are off to the side, watching two people converse. Having the Talking Head speak down the lens is considered a more direct method of delivering the message. If the respondent is not a recognised presenter, their ability to remember and deliver long lines of text may be stretched. In this instance an autocue can be a handy tool to assist in settling the subject and ensuring the delivery of the required content. Be aware that using an autocue can sometimes appear less genuine or even stilted. This camera technique is used to garner the most authentic performances from respondents, while looking straight down the camera barrel. Great for countering many of the drawbacks associated with an autocue down the lens. The camera is rigged behind a two-way mirror, meaning that the interviewee appears to be looking at the face of the interviewer. They interact and answer the questions as though speaking face-to-face, while the camera rigged behind the mirror captures the eye line directly down the lens. Often a pre-approved script is a necessary requirement for the content being delivered. When not using a professional presenter or an autocue, it is very difficult to ensure an effective, engaging performance. In this instance a multi-voice edit approach is often a reliable solution. This takes the approved script and puts it in the mouths of multiple members of an organisation. In the edit suite, a compile of best delivered lines can be assembled. If you have the budget and it aligns with the messaging, then consider using professional talent. They will typically act as a brand spokesperson, so their eye line will most often be down the lens. It’s rare to set presenters up looking off camera, but these are not fast rules. Casting becomes key, so make sure the talent is a good representative of your brand or business. More often than not paid talent are capable of memorising and delivering your script, but you get what you pay for, so in some instances an autocue provides a good safety net. From the Latin, voice of the people, this is capturing popular opinion as represented by informal comments from members of the public. Often filmed as street interviews, they can be highly engaging, but rely on a strong edit to craft a concert of voices. 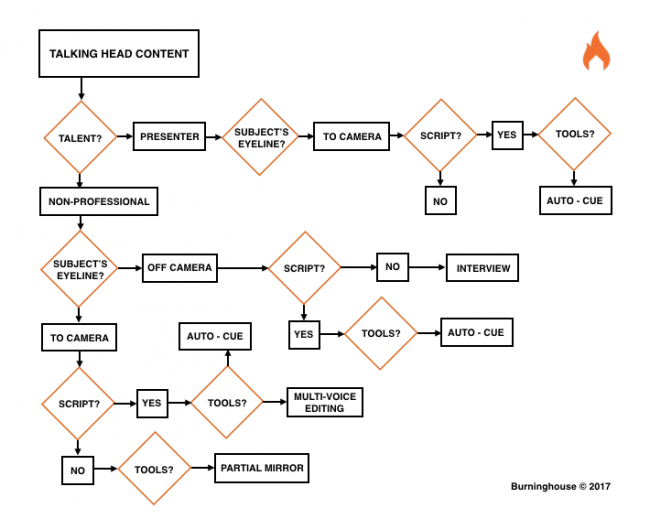 This is by no means an exhaustive list, but should help demystify some of the various approaches to take with your content. 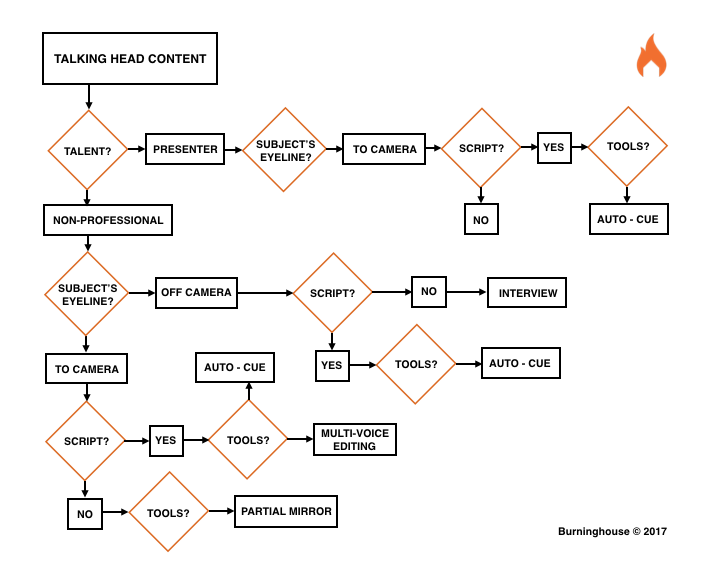 Furthermore, refer to this handy decision chart to plot your potential content, or speak to us.